Bourbon Heritage – Highbridge Barrel Co. Throughout the Bluegrass state there has always been a genuine sense of pride and respect for the rich heritage of bourbon whiskey. The recent boom in bourbon production, along with a thriving tourism industry would indicate that respect is now reaching global proportions. What started out as a crude drink in the quiet backwoods of Kentucky has evolved to become one of the most complex and popular spirits in the world. It’s impact on the unique cultural identity of America is undeniable. The bourbon story is as home grown and one-of-a-kind as it gets……..but before there was bourbon, there was whiskey. The term “Whiskey” is a word that was passed around for several centuries in Europe and eventually translated into Classical Gaelic as “uisgebaugh” (WEEZ-ga-bochh), meaning “water of life”. Distillation for perfumes, aromatics and medicine dates back thousands of years, with records showing it’s presence throughout ancient civilizations. But it wasn’t until the 12th-13th century that the practice of distilling alcohol came into existence. By the 15th century, medieval monks of Scotland and Ireland were re-fining the practice and introducing it to mainstream culture. With the new world on the horizon, many soon to be immigrants were already well equipped with an understanding and know-how in the art of distillation. Right from the start, immigrants arriving in North America were concocting libations of all sorts. It would be safe to say that most palates of the time were not looking for a smooth, complex, big-bodied spirit to sip and savor, as long as it was palatable and helped cope with the hardships of daily life. Even while the country was still in it’s infancy, certain events were culminating that would spur the development of the American whiskey industry. Around the middle of the 1700’s, frontiersman were scouting new territory of the “west” in a region called “Cantuckee”. From the earliest recorded accounts, explorers were in awe of the natural beauty and abundance of resources this area had to offer. Rich, arable soil, game aplenty, and a labyrinth of springs and navigable waterways coursed through the region. In the years that followed, rumors circulated and Kentucky began to take on a somewhat idyllic status as a sort of promised land. Eventually, pioneering families began to make the push westward, over mountain passes from Virginia and the Carolinas, or down rivers from the Northeast on flat boats in search of the fabled paradise. Towards the end of the 18th century settlers began to arrive into what was then known simply as “Kentucky County”, a vast territory of Virginia just west of the Appalachian mountains. Beginning a new life in the wild frontier was not for the faint of heart. In an effort to entice would be immigrants to spread out and settle in the area, the Virginia General Assembly granted what was commonly known as the “corn patch and cabin rights” incentive. Enacted in 1776, this law granted settlers to lay claim to 400 acres of land, provided they built a cabin and planted a crop of corn prior to 1778. Many of the settlers putting down roots in the region were of Scotch, Irish and German descent. These men and women were well suited for the wild frontier and along with their pioneer spirit many of them brought distilling knowledge from the old world. It was not uncommon for some farmers of that time to have in their possession small pot stills, since a jug of liquor was an important part of everyday commerce. There was not much hard cash in circulation during that era, so bartering and trading was the name of the game. Up to that point, distilled spirits from fruit, rye, wheat and barley was fairly common place. Corn was less familiar as a primary ingredient, but they soon realized that the indigenous grain flourished in their new found homeland and the massive yields at harvest time would have to find some diversified uses or else spoil. The foundations of the bourbon industry were being laid by those early, frugal farmers. But it takes more than bumper crops of sweet corn to make good bourbon. Early settlers didn’t know it at the time, but Kentucky has one of the most expansive and complex web of tributaries in North America. Not only is there an abundance of fresh springs and streams throughout the state, the quality is also perfectly suited for distillation. Limestone formations beneath the surface of the soil filters out unwanted minerals, producing a calcium rich, iron free water source that to this day is a key characteristic to the production of some mighty fine bourbon…. not to mention strong boned thoroughbreds. In addition to clean, filtered drinking water, Kentucky boasts more miles of navigable water than any other state in the continental U.S. 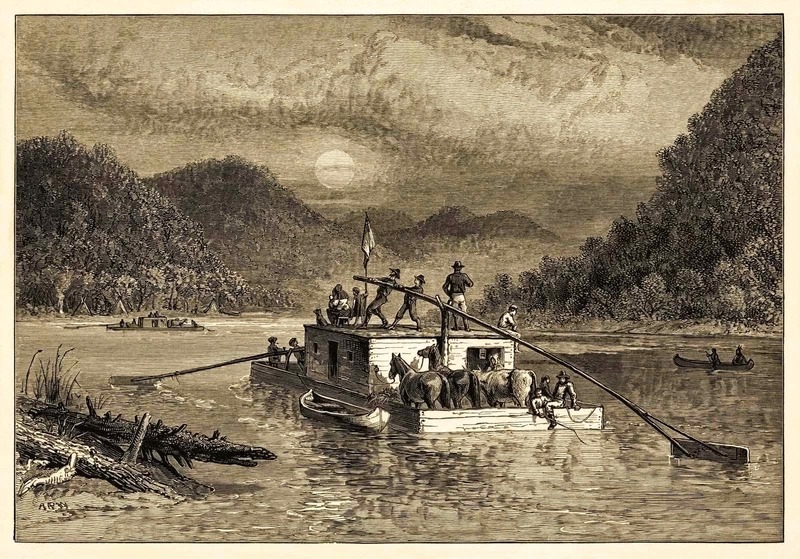 Therefore it stands to reason that most of the settlements of any importance were being established close to a prominent waterway that ultimately connected to the Ohio river – a main vein of commerce for the entire region. During the cool, winter period after harvests, pot stills were operating in ernest. Corn liquor that had been made would have been divvied up for personal consumption or medicinal purposes, then much of it stored away to be sold off in the warmer months or when river transport allowed. The most common and practical option for storage and transport over the hills or down the river was the wooden cask – the barrel. Wooden barrels were just about the only safe means of storage and transport of all sorts of sundries. From dry goods like flour, spices, coins or ammunition…..to oil, tar, fish & meats. Barrel building, or “cooperage” as it’s called, was a common vocation even on the frontier. With the general concept relatively unchanged, the art of cooperage has been around for more than two thousand years, making it one of the most enduring commodities of all time. Just about any self-respecting settlement had a cooper. And with over 17 native species of white oak in the region of Kentucky, there was no shortage of the proper wood for raising a barrel. Quite unlike our world today, just about everything during that period was used up, worn out or re-cycled in some capacity. The wooden barrel was no exception. Common practice was to burn the inside of casks after each consecutive use so as to “clean” or rid it of lingering odors, dirt, etc. A barrel could last for many years with a multitude of uses throughout it’s life cycle. Most early distillers didn’t even realize that the method of storing bourbon in charred white oak barrels would actually play a huge role in the evolution of “Bourbon Whiskey”. After all, aging bourbon in burned casks did not become common procedure until the early part of the 19th century, several decades after it’s inception. But it’s effect on bourbon was significant. A critical portion of the character and flavor is a direct result of the interaction of the charred oak, the spirit and the weather. Kentucky’s substantial swings in temperature cause the cellular structure of the wood to react in a magical way, allowing the barrel to inhale white dog and exhale Bourbon. The result is a myriad of complex and distinctive notes that aren’t present until after the aging process. By 1786, “bourbon” was known only as “Kentucky” or “Western” whiskey. This allowed it to be distinguished from the rye whiskeys of the northern states. That same year, Bourbon County was formed from a large area of Virginia’s Fayette County, in modern day Eastern Kentucky. The principal port of Maysville, Ky. was a launching off point for commerce down the Ohio, all the way to the Mississippi River and then on to New Orleans. Barrels shipping out of this main port were often marked “Old Bourbon” as it was a part of the newly formed Bourbon County. This could be how the name “Bourbon” originated. Then again, many believe it’s name evolved over the course of time due to the french influences of its main export destination in New Orleans. The truth of how it acquired it’s name is a bit of a mystery, but one thing is certain. The legacy of Bourbon has become recognized around the world as a drink that embodies the innovative and pioneering spirit of America. By law, bourbon can be made anywhere in the USA, but for nearly 250 years the bulk of it has been produced and aged inside the boundaries of the Bluegrass. Today, more than 95% of the worlds supply comes out of Kentucky. And for good reason. Its as if mother nature’s ingredients were taylor made for it’s creation. The water, grain, wood and climate provides the perfect concoction for a product so darned American that in 1964 Congress passed legislation defining Bourbon and the legal requirements of it’s production, making it a bonafide product of the United States. Now that’s a heritage deeply rooted in the land itself. So, it’s no wonder that America’s only native spirit would find it’s origins in the Bluegrass state. From old growth woodlands and lush river valley’s, to the deep hollers and rugged mountains of Appalachia, the landscape and features of Kentucky evokes a timeless beauty and down home warmth that charms visitors and residents alike. One of our favorite frontiersmen said it best….